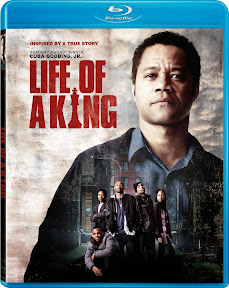 In his sophomore feature Life of a King, writer/director Jake Goldberger proves he’s as committed to bringing stories of custodians to the big screen as he is working with an Oscar caliber cast once again in this period movie biopic follow-up to Don McKay. And while thankfully he doesn’t need his janitor main characters to clean up the overall film as this is vastly superior to the mess that was the Noir inspired Don McKay, unfortunately Goldberger still can’t manage to break out of the safety net of film formula familiarity. Much like the feeling derived in his first “mix-tape” like movie that we’d seen done many times before, this is a competently made, average biopic feature that just can’t seem to shake the overbearing weight of so many inspirational underdog stories that have come before it from the Terrence Howard starrer Pride to Hilary Swank in Freedom Writers (just to name two thematically similar vehicles). Nonetheless, in addition to yet another dynamic portrayal by the criminally underutilized actor Cuba Gooding Jr. is the film’s intriguing origin story. 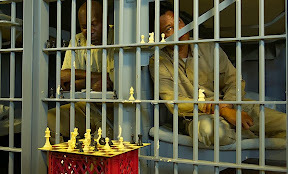 Life of a King centers not on an idealistic teacher but an ex-con who leaves prison following a lengthy armed robbery sentence who goes on to form the Big Chair Chess Club, inspiring inner-city and/or at-risk youths to use the lessons from the game in their everyday life where there are no do-overs and everyone must obey the rules. Unfortunately the personal life of its charismatic lead – Eugene Brown (Gooding Jr.) including his estranged relationship with his children gets shortchanged in what ultimately takes a formulaic Afterschool Special approach to the plotline. But despite the fact that the film invests too much screen time on a generic subplot involving a few of his student chess players that would’ve been better left on the cutting room floor to get to know Brown on a deeper level instead, ultimately you can’t fault King too much. Even though it’s predictable from start to finish, it achieves exactly what it sets out to which is to celebrate a man who turned his life around in yet another inspiring, positive tale of community activism that should particularly play well to viewers who have enjoyed thematically similar works. While it doesn’t have the finesse or big budget presentation of a Glory Road or Great Debaters, King gets bonus points for (much like the aforementioned Writers and Debaters) focusing on an intellectual pursuit via a mental sport as opposed to the traditional cinematic slam dunk tales of underdog champions who score touchdowns, homeruns or goals despite the odds. 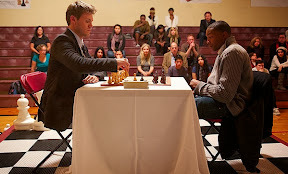 And even though checkmates may be less visceral or visually thrilling than an athletic display, they’re no less rewarding when it comes to character building as epitomized by Brown, as we learn how much he’s accomplished onscreen and off in making a difference in student lives. While there’s not much in the film we haven’t seen before – at least in some form or another – it’s still a well-made, worthwhile picture that plays particularly well as a conversational double feature alongside Lee Daniels’ The Butler, which was another recent African-American biopic that featured Gooding Jr. Destined to raise all sorts of questions about the pros and cons of budget size as well as staying true to the source material or embellishing facts for the sake of entertainment, whether you start with a presidential Butler or go with Goldberger’s janitor King first, you have the makings of a lively movie night discussion that will undoubtedly elevate your enjoyment of both pictures that much more. Labels: Blu-ray, Blu-ray Review, Cuba Gooding Jr.